STORY: People in India’s western Surendranagar district are left with no option but to drink water from a polluted pond in the absence of a clean water supply. 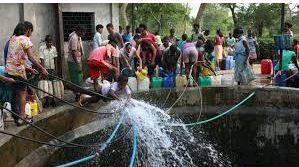 Villagers of Untadi village allege authorities have failed to take any concrete steps in providing them with clean drinking water even after two to three months of not receiving water from the Narmada river, their traditional source. Women were seen filling pots as cows drank water from the same trough containing water coming from a pond. A villager Geeta said her son had fallen ill because of drinking the polluted water and had to be taken to the clinic. Water crisis is not a new phenomenon in India. Many parts of India experience water shortage in rural as well as urban areas in the country. The World Bank estimates that 21 percent of communicable diseases in India are linked to unsafe water and the lack of hygiene practices.